From Joe Connor and Mike Duncan comes an entertaining, emotional and inspiring original novel about the father of our country’s miraculous run for president in 21st century America. 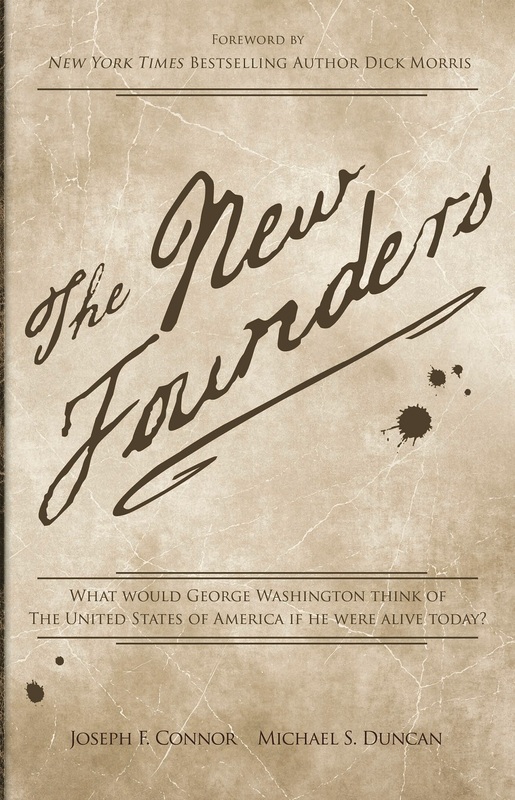 In The New Founders, the authors bring George Washington back to life taking on today’s issues as he seeks the presidency with the help of his 21st century founding brothers. While touring Independence Hall the new friends encounter a mysterious man dressed in colonial garb who confirms to them their true identities. The men are overwhelmed by the evidence that they are the reincarnates of our founding fathers, Jefferson, Madison, Franklin, Hamilton and John and Sam Adams, brought together by Providence and the mysterious man who they come to accept as none other than George Washington. After their soul searching and self doubt subsides, the New Founders and their leader General Washington embark on an emotional and often humorous journey to our nation’s capital in search of Providence’s intentions for them. On the way, The New Founders present a crash course on U.S. history to the father of our country, introducing him to and reminding the reader of the marvels of 21st century America that so many of us now take for granted. Washington, shaken by learning of the horrors of the Civil War, finds himself drawn to the Lincoln Memorial and the humble strength of President Abraham Lincoln. After his spontaneous speech extolling Lincoln’s strength and our constitutional values on the steps of the Memorial creates a national sensation, radio talk show host Josh Anders and the other New Founders, realizing Providence’s intentions, convince Washington to run for president. The New Founders build Washington’s platform based on our principles of Life, Liberty, Property and the Pursuit of Happiness, all of which are defined in the Declaration of Independence and the United States Constitution. In doing so, they engage the reader by debating the major issues of today using the timeless, actual words and broad ranging ideas of the founders themselves. The reader will realize that many of today’s challenges are the very same as those our country faced during the American Revolution and can only be solved by adherence to our enduring constitutional principles. Candidate Washington, using a cleverly contrived alias, combats a snarling press obsessed with his destruction and an arrogant incumbent president bent on controlling the American people. Washington ultimately vanquishes these 21st century rivals buoyed by an electorate starved for a candidate who not only believes in them and their principles, but can plainly articulate the greatness of our society. Realizing his work is complete George abandons his presidential bid and, as he did in 1796, declines what would have been his third term. 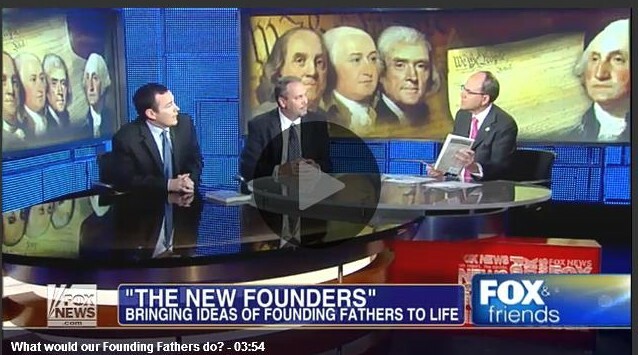 Readers of all ages will be captivated by the uplifting New Founders as they, for the first time, are introduced to the founders as real people. Readers will understand that many of today’s challenges were foreseen and addressed over 200 years ago by those enlightened forefathers. Connor and Duncan deftly sew the founders’ actual words and beliefs into the fabric of modern America showing that they are as relevant now as they were 200 years ago. 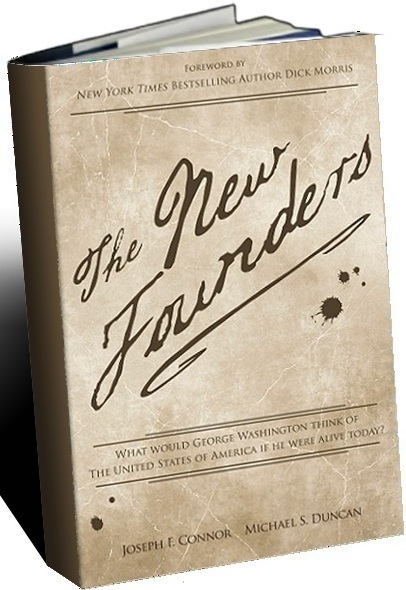 In The New Founders, readers will learn about the great principles of our nation in an emotional, entertaining and inspiring whirlwind ride through American History and into our future.